Rising from Greece, now signed to Cyprus based Pitch Black Records, comes Emerald Sun with their sophomore effort Regeneration. Frankly, this is pure European melodic heavy/power metal, plain and simple. Honestly, and without bias, Regeneration. is average material. Certainly, Emerald Sun knows their chosen genre: the songs are creative and sound, the musicianship strong. However, most of this we have hear before. But that doesn't mean that Emerald Song can't deliver the goods: Starchild is good stuff, Speak of the Devil has an excellent bass line, and Planet Metal reminds you of why you love power metal. Emerald Sun can be extravagant: clocking in at over 12 minutes, Fantasmagoria is epic, entertaining, but still predictable. What Emerald Sun lacks are true 'hooks' to draw you in. Edguy they're not. Emerald Sun covers Holding Out for a Hero, written by Jim Steiman (Meatloaf) and Dean Pitchford, and recorded by Bonnie Tyler for the movie Footloose (1984). It's heavy and fast, but hardly imbues the original with new life. 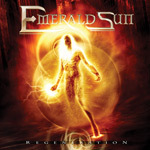 While pure and predictable European melodic heavy/power metal, Emerald Sun should be given kudos for effort. Ultimately, however, I will not be pulling this work down for future listens. Fans, of course, would disagree.